Fred Melton was one of the most popular young men Griffin has ever known. Friends describe him as an active, lively and mischievous little boy. Fred was born in Americus, Georgia. He and his older brother, Quimby Melton, Jr., moved to Griffin when Fred was six months old. His father, Quimby Melton, Sr. was the editor and publisher of the Griffin Daily News, a newspaper he purchased in 1925. Fred’s mother was Mary Davenport Melton. Fred’s class was the first to enter the new Third Ward Elementary School, in 1930. Fred also attended school in the historic Sam Bailey School, and Griffin High School, when it faced East Poplar Street (the old steeple building on the GS Schools Campus). Fred was an Eagle Scout when he was 15, had a paper route and was an excellent athlete, lettering in both football and basketball. Fred Melton was a charmer. His paper route customers would always understand if he was late. In school Fred was popular with both his friends and teachers, his personality perhaps stronger than his grades. His major in school…friendships. Fred had friends with people in all parts of Griffin, of all ages. A more popular boy has never been known in Griffin. Fred was crazy about the girls and they gladly returned his appreciation of them. When Fred was a senior in high school, he transferred to the Baylor School in Chattanooga, Tennessee. There he graduated in 1941. Fred received a year of military training while at Baylor. He was offered an appointment to both the US Naval Academy in Annapolis, Maryland, and the US Military Academy in West Point, New York, but decided to attend the Citadel in Charleston, South Carolina. With the entry of the United States into World War Two after Pearl Harbor, Fred was eager to join the US Army, but was too young to do so without parental permission. His mother and father agreed. When he turned 18, with his parents consent, Fred volunteered for service. 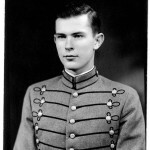 Fred then attended the University of Georgia and enrolled in advanced ROTC courses. His friends urged Fred to stay in school and earn his officer commission. But Fred had other ideas. With all his charm and wit, Fred laughed and said he would become an Army officer before his classmates…….and he was!!!!!!! Fred’s Army training took him to Ft. Riley, Kansas, where his older brother, Quimby was also stationed. The two brothers even shared a room at the Bachelor Quarters while at Ft. Riley. 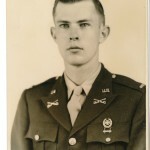 His brother, Quimby, would marry at Ft. Riley in 1943. Not only did Fred arrange the wedding ceremony, he was also the best man. The colorful ceremony was one of the last of its kind within the Cavalry as the Army’s Cavalry was transitioning from horse units into mechanized ones. The transport landed in England at the end of August, 1944. Fred and his unit soon found themselves at the border of the Netherlands and Germany, on the front lines. The “Battle of the Peel Marshes,” centered near the town of Sittard, Netherlands. Fred and his unit were assigned to head toward Tuddern, Germany. The night before the offensive began, Fred spent the night in a Dutch Reform Church with the priest. There they prayed for safety of the unit and it’s men. The next morning, October 3, 1944, Fred and his unit headed toward Havert, Germany. The German machine guns were stationed in strategic positions within the marshes. Immediately upon encountering the German troops, men within Fred’s unit began to be shot. Fred would rescue four of the injured men, carrying them on his back to safety. Fred headed toward an injured fifth man. He was mowed down by German machine guns. Fred Melton died immediately in the open fields of Havart, Germany. The news of the death of his popular young man, hit Griffin hard. His older brother, Quimby, who was fighting in New Guinea, would not learn of the death of his younger brother for several weeks. 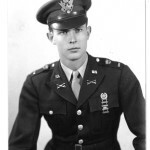 Barely twenty years old, Fred was awarded the Silver Star by the US Army for his gallantry in action. Frederick Davenport Melton is buried in the United States Military Cemetery in Margraten, Holland.